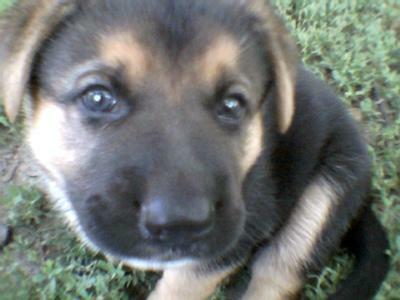 This is my GSD puppy Saint when he was 1 month old. It is my favorite picture of him because it looks like he is posing. I have always loved German Shepherds from the time I was little, but he is the first one I have had the pleasure of owning. I visited him daily from the time he was one and a half weeks old until I took him home at 6 weeks. He is 10 and a half weeks now and is growing like a weed... that is given miracle grow 5 times a day. He loves to go around town with me because of all the attention he gets. We live two blocks from the river and he loves to go swimming and splashing in the water! His favorite game is tug. I have never seen a dog as determined to win, he refuses to let go! Our neighbor has a Shar Pei named Toby, and Saint loves to go to the fence and see him. When Saint was a little guy he went to see Toby. Saint barked at him, Toby curiously watched the lil pup, and all of the sudden Saint started yelping, then ran as fast as he could to hide under the car. It was so funny! Now they are good friends and the first thing Saint does when I let him outside is go say Hi to Toby. Saint is my best friend and I'm so glad I finally made the investment in a truly amazing dog.